The Easter Rising 1 oz Gold Medal has been struck the highest proof quality. Features the Seven Signatories of the proclamation. On Easter Monday an Irish Republic was proclaimed at the General Post Office on Dublin’s busiest thoroughfare, Sackville Street. The GPO became the headquarters of the newly proclaimed Irish Republic and housed a provisional government led by Padraig Pearse. From the GPO, a building that is now a symbol of Ireland’s independence, a proclamation was read to bemused passersby with some 1,000 copies distributed in the city. The proclamation had been signed by the members of this provisional government: Padraig Pearse, Sean MacDiarmada, Thomas MacDonagh, Joseph Plunkett, Thomas Clarke, Eamonn Ceannt and James Connolly – also known as the Seven Signatories. The proclamation committed the Republic to universal suffrage, guaranteed religious and civil liberty and promised to cherish ‘all of the children of the nation equally’. In the language of romantic nationalism, the proclamation claimed that while supported by its ‘exiled children in America’, Ireland mist rely first and foremost on its own strength so as to ‘prove itself worthy of the August destiny to which it is called’. 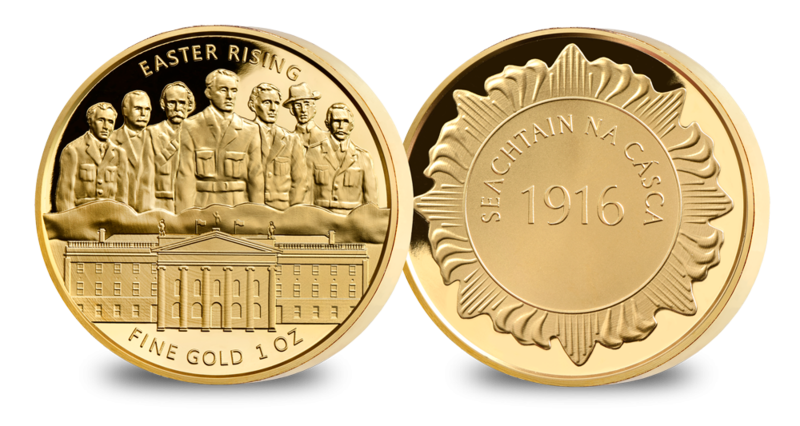 The Easter Rising 100th Anniversary 1oz Gold Medal pays fitting tribute by featuring the General Post Office and the Seven Signatories of the 1916 proclamation. And with the reverse featuring a laurel inspired by the original 1916 medal and the inscription “SEA TAIN NA CASA 1916”.